Trolls prowl and conflicts rage in online propaganda. External actors force themselves across borders precipitating an icy hot international stalemate. Thousands take to the streets demanding transparency and change. cabaret of real time events and Facebook feeds, iconic Ukrainian poetry, catchy vamps, and improvised action. Rambunctious and audacious, the piece questions through the intense lens of childhood. How do we understand? Who are we in a time of sensationalized information and deceptive surfaces? Where is our place in our world and in history? What’s That? A production of the breakthrough Teatr-Pralnia (Laundry Theater) with Ukraine’s leading contemporary hub, CCA Dakh, directed by theatrical disruptor, Vlad Troitsky. PRODUCTION 110 minutes. Ukrainian, Russian, and English. Backline and community sourced living room furniture. Multi-performance runs encouraged. VENUE Black box to mid-size stages, and clubs (capacity 100-800). 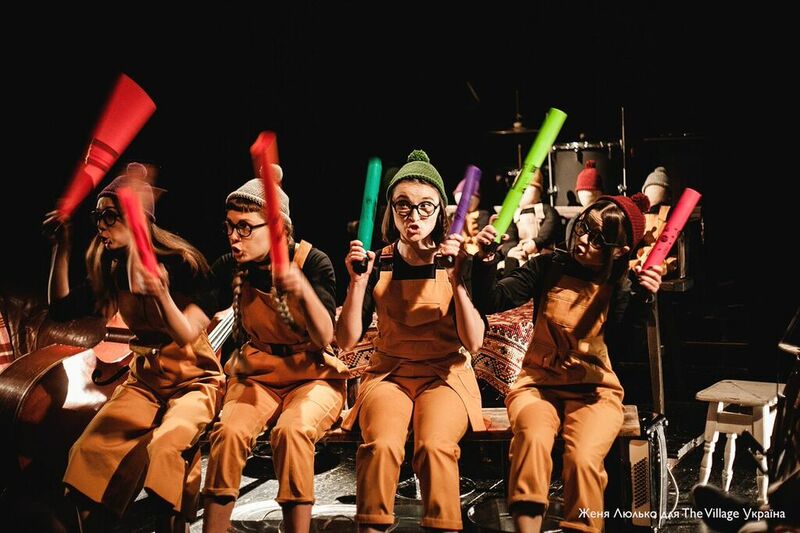 Borderless Identity Bricolage: The Super-Charged Puppet Cabaret of Teatr-Pralnia Ask Big Questions in TseSho?/What’s That? Catalyzed by intense upheavals, Egyptian and Ukrainian performing artists are animating their nations’ public spheres. Now, some of the strongest performers and creative innovators from these countries are coming to the U.S., to share their perspectives and broaden ours. The 2018 Center Stage ensembles will visit and engage with people in 16 states and the District of Columbia. The artists will perform in a wide range of locations and venues, from large cities to small towns. Venues will include major performing arts centers such as the Kennedy Center in Washington, DC as well as universities, cultural and community centers, festivals, contemporary art venues, music clubs, and artist-run spaces. The program will bring one independent journalist from both Egypt and Ukraine to travel to the United States to report on the tours. Tour details and experiences will also be featured on the Center Stage website (www.centersageUS.org) and through U.S. Department of State social media. “Ensembles travel to the U.S. from around the world and enhance the cultural vibrancy of our nation, while promoting economic opportunities in American communities,” said Cathy Edwards, Executive Director of the New England Foundation for the Arts. “Arts delegations cultivate the mutual respect and appreciation that is the essence of cultural diplomacy”. Center Stage was launched by the Department of State to bring international performing artists from select countries to the United States for professional growth and touring, supporting foreign policy, deepening our relationships with foreign publics, and strengthening the U.S. creative economy. The visiting artists learn from their U.S. tours and share their experiences in their home communities, where they serve as role models and opinion leaders. To date, 24 ensembles from seven nations have toured the United States through Center Stage, reaching tens of thousands of Americans directly and millions of international fans through media and social media. Audiences and the presenters who serve them are looking to directly connect with creative people from other parts of the world. Center Stage, by mitigating financial risk and managing the complexities of international exchange, has ensured high-caliber international artists and audiences meet. Center Stage is among the most successful programs to bring contemporary international artists into direct contact with people across a wide range of American communities. Through performances, workshops, discussions, classroom visits, artist-to-artist exchanges, and community gatherings, Center Stage ensembles engage with audiences onstage, offstage and online, sharing their work with audiences in the United States, and friends and fans at home. The program also impacts the lives and professions of the visiting artists. "Center Stage is a program aimed at cultural exchange, but for our band, it also tapped into something much deeper,” says Center Stage Season 2 artist Sparlay Rawail, of Pakistan’s Khumariyaan. “We learned what being working musicians is all about and how to communicate. We now have a deeper sense of our own culture through the eyes and ears of others -- from the outside in. But above all, this tour opened our minds as human beings and made our art that much more sincere." “Keep this program going! It's making a huge difference in our rural community,” exclaims Kathryn Maguet, Executive Director of the Weis Center for the Performing Arts at Bucknell University in Lewisburg, PA, which has partnered with Center Stage since the first season and will host Mohamed Abozekry & Karkadé and Youssra El Hawary later this year. Dina Elwedidi (Giza, Egypt) A sophisticated musical innovator, Elwedidi ravels the personal threads of Egyptian heritage and contemporary identity. U.S. tour: September 14-October 18. Tour cities include Washington DC, Richmond VA, Boston MA, New York City, Austin TX, and West Palm Beach FL. Kurbasy (Lviv, Ukraine/U.S. debut) Tight vocal harmonies, resonant lyrics, and phantasmagoric imagery from the Carpathian Mountains. U.S. tour: October 21-November 18. Tour cities include Washington DC, Hartford CT, Memphis TN, Rohnert Park, CA, Albuquerque and Santa Fe NM, and Seattle WA. Mohamed Abozekry & Karkadé (Cairo, Egypt/U.S. debut) Virtuoso oud prodigy convenes Egypt’s popular and classical music traditions, Sufi calls, and secular poetry with a new instrumental project. U.S. tour: September 6-30. Tour cities include Washington DC, New York City, Lewisburg and Philadelphia PA, Burlington VT, and West Claremont NH. U.S. tour: September 28-November 4. Tour cities include Gainesville FL, Allentown and Pittsburgh PA, Portland OR, and Albuquerque NM. Youssra El Hawary (Cairo, Egypt/U.S. debut) A musical bellwether of everyday life, El Hawary’s indie sound captures the stories of Cairo and the alchemy of the Mediterranean basin. U.S. tour: September 9-October 13. Tour cities include Richmond VA, Washington DC, Lyons NE, Raleigh NC, Kittery ME, West Claremont and Lebanon NH, Albuquerque NM, and New York City. By the end of 2018, 29 performing arts ensembles from nine nations -- Algeria, Egypt, Haiti, Indonesia, Morocco, Pakistan, Tanzania, Ukraine, and Vietnam -- will have toured from coast to coast as part of Center Stage. 20 of these ensembles will have made their U.S. debuts with the program. Center Stage is a public diplomacy initiative of the U.S. Department of State's Bureau of Educational and Cultural Affairs, administered by the New England Foundation for the Arts in cooperation with the U.S. Regional Arts Organizations, with support from the Doris Duke Foundation for Islamic Art, and the Trust for Mutual Understanding. General management is provided by Lisa Booth Management, Inc.
For press inquiries on the Center Stage initiative, contact ECA-Press@state.gov. 11/07/2017, Borderless Identity Bricolage: The Super-Charged Puppet Cabaret of Teatr-Pralnia Ask Big Questions in TseSho?/What’s That? 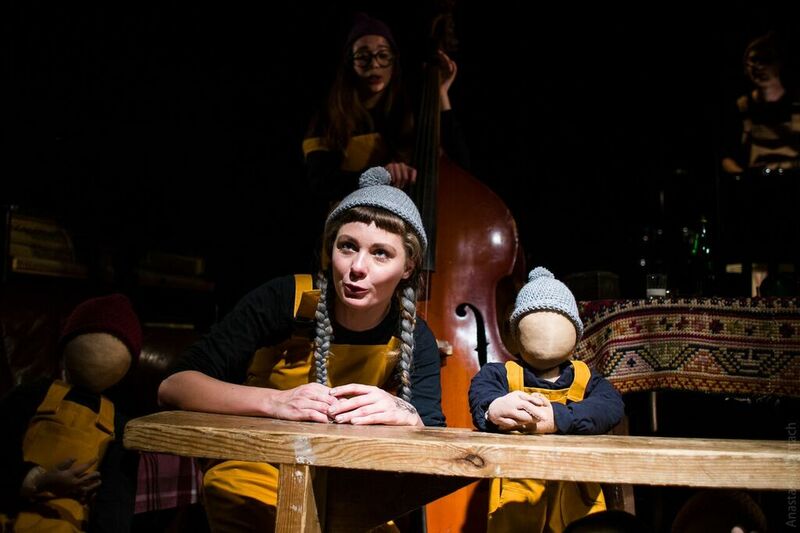 11/07/201711/07/2017, Borderless Identity Bricolage: The Super-Charged Puppet Cabaret of Teatr-Pralnia Ask Big Questions in TseSho?/What’s That? 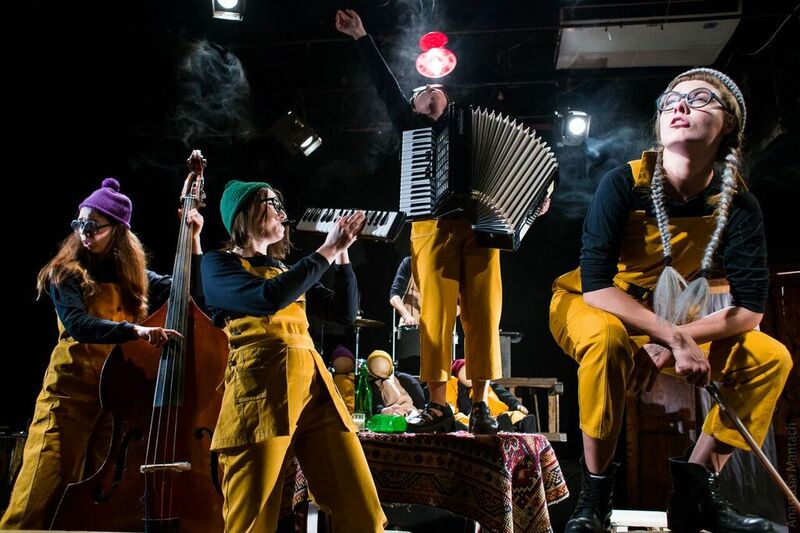 Kyiv’s Teatr-Pralnia (Laundry Theater) draws you into an apartment living room, settling you amid a couch, overstuffed chairs, a bench, a wash tub, and scattered rugs; bric-a-brac on every surface and instruments in every nook. There, five kids in overalls shout, sing, recite, scramble, and play, sometimes with their counterparts -- five identically dressed doll-puppets. There’s passion and loopy drabness, curiosity and disassociation. 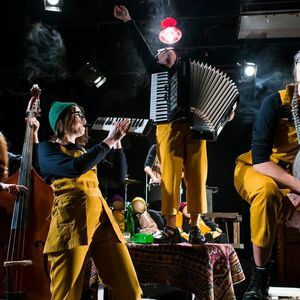 Rhythms propel musical numbers that are funny and madcap and intense, connecting to passages from great Ukrainian poetic texts and disposable Facebook posts with folk song rhymes, and off-the-cuff vamps all rolled into a non-stop puppet cabaret. You may ask “What’s That?” and that’s exactly what Pralnia wants. Guided by director Vlad Troitsky, the widely admired mastermind of GogolFest, and the Dakh Contemporary Arts Center (CCA Dakh), (home company of DakhaBrakha and Dakh Daughters), in TseSho?/What’s That? Pralnia deploys a cabinet full of musical and theatrical material. They peer through the innocent and incisive lens of children to ask honest, urgent questions about a world they’re struggling to understand. How do we form an identity in a world of buzzing (mis)information and deceptive surfaces? How do we come to terms with our place in the world and in history? TseSho? 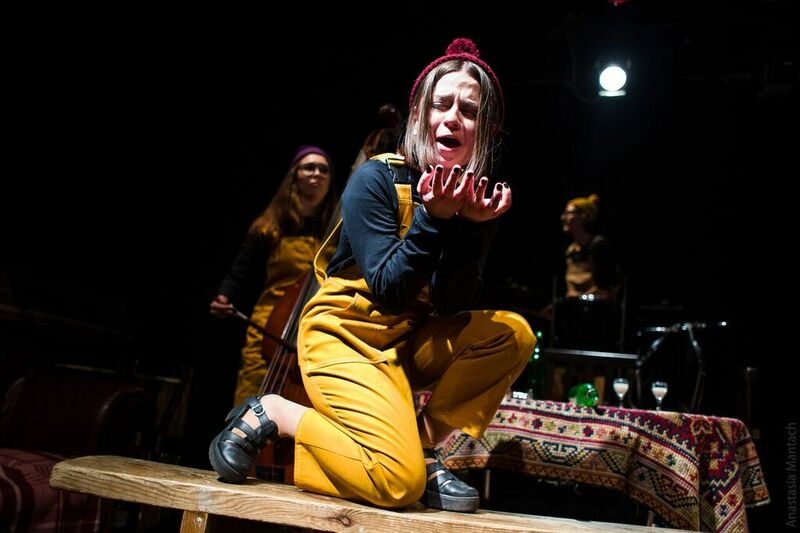 Teatr-Pralnia joins four other ensembles from Egypt and Ukraine that will make independent tours of the U.S. from July-December in 2018 as part of Center Stage, a cultural exchange program that invites performing artists from abroad to the United States to perform, meet, and share their experiences with communities around the country. Center Stage is a public diplomacy initiative of the U.S. Department of State's Bureau of Educational and Cultural Affairs. The troupe put on skits and shows --- in the streets, in found spaces, small theaters -- gathering followers like fearless pied pipers to their quirky performances that commanded attention with bold, folk-style voices, cagey lyrics, and compelling, poker-faced delivery. Troitsky loved the work -- “there’s a bit of troublemaking in what they do,” he says slyly -- and he invited them to create a piece together at Dakh, Ukraine’s influential performance incubator. They opted for what they dubbed a “puppet cabaret,” capturing the edgy intimacy of the club variety show while using blank-faced puppets to explore complex themes. The experience of putting together What’s That pushed Pralnia’s performers to blow open their performance skills. They decided the play demanded instrumental music. Each actor picked their own. “Before this play, we didn’t play instruments,” laughs Ionova. “We chose the instrument that appealed to us the most. Some of us played around on our own, and some took lessons.” Like much else about TseSho, the ensemble of double bass (Nadiia Golubstova), cello (Marusia Ionova), melodic (Kateryna Petrashova), accordion (Marichka Shtyrbulova), and a haphazard trap set (Igor Mytalnykov), supplemented with ocarinas, whistles, and boomwhackers, creates a freewheeling aural and visual cacophony that extends the work’s emotional range. The city on the way to the theater has ample food for thought to offer. Kyiv has been at the heart of Ukraine’s upheavals, mass protests, violence, and high hopes since the nation’s independence in 1991. Today, while virtual battles rage in online propaganda and trolling, and malware worms its way into vital computer systems, very real combat continues in eastern Ukraine and in the Crimea following Russia’s military annexation of Ukrainian territories in 2014. This land grab has precipitated a weakened political system, a divided populace, a refugee crisis, misinformation campaigns, and dissident crackdowns – some of the very issues now erupting around Western Europe and America. TseSho?/What’sThat? approaches these developments from a perspective that foregrounds the ambivalent and multifaceted tensions we face between our inner and outer worlds. Like its children protagonists, Pralnia’s performers here project tensions, determinations, stresses, and feelings rather than events. It isn’t about politics; it’s about human experience. Center Stage is a public diplomacy initiative of the U.S. Department of State's Bureau of Educational and Cultural Affairs, administered by the New England Foundation for the Arts. From June-December 2018, Center Stage will tour five ensembles from Egypt and Ukraine in the U.S. These are Dina Elwedidi (Giza, Egypt), Kurbasy (Lviv, Ukraine), Mohamed Abozekry & Karkadé (Cairo, Egypt), Teatr-Pralnia with CCA Dakh (Kyiv, Ukraine), and Youssra El Hawary (Cairo, Egypt). Now in its fourth season, by the end of 2018, 29 performing arts ensembles from nine nations -- Algeria, Egypt, Haiti, Indonesia, Morocco, Pakistan, Tanzania, Ukraine, and Vietnam -- will have toured from coast to coast, hosted by colleges and universities, festivals, music clubs, and cultural centers. Each tour includes residencies in large cities and small towns, and a range of activities from performances, workshops, and discussions, to artist-to-artist exchanges, masterclasses, and community gatherings. Center Stage artists engage with audiences onstage and online sharing their work with audiences in the U.S. and friends and fans at home to build mutual understanding through shared cultures and values. Center Stage is made possible in cooperation with the U.S. Regional Arts Organizations, and with support from the Doris Duke Foundation for Islamic Art, and the Trust for Mutual Understanding. General management is provided by Lisa Booth Management, Inc.